I thought I’d share a little kitchen wishlist complete with swoon-worthy kitchen accessories and fabulous storage solutions. Admittedly our flurry into home improvements has almost ground to a halt, with the weather being so incredible it seems silly to be stuck indoors knee deep in paint and plaster! So that I don’t lose motivation entirely with our kitchen renovation, I thought what better way to keep on the right track than a little window shopping?! 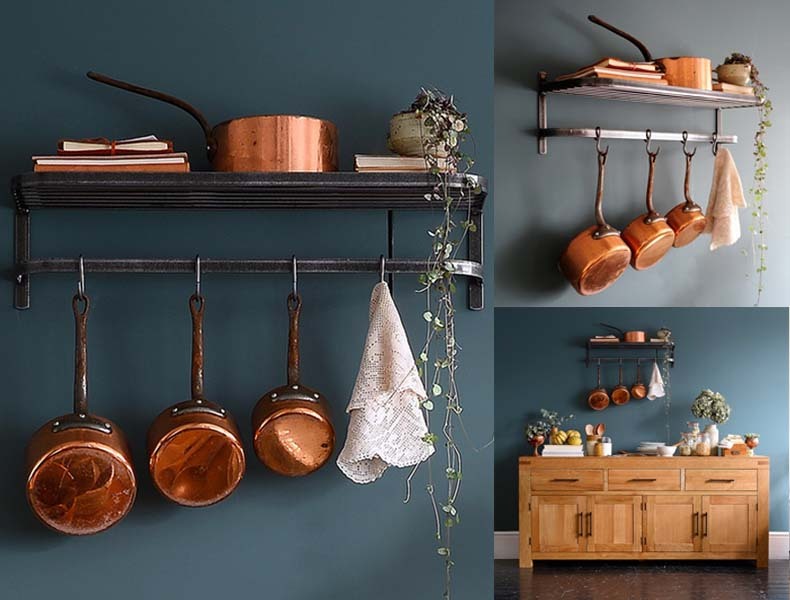 Here’s a look at my current kitchen wishlist… Storage: Throughout the many discussions about our kitchen renovation we have been set on open shelving, although we haven’t exactly got a pristine copper pan collection (yet) Mr T and I love the idea of having everything hung and ready to use. The Mera shelf unit from the Cotswold Co. is ideal and not too large so would look great in our smallish kitchen. Copper: Mauviel copper manufacturers date back to 1830, hailing from the Normandy village Villedieu les Poeles aka ‘the city of copper’. 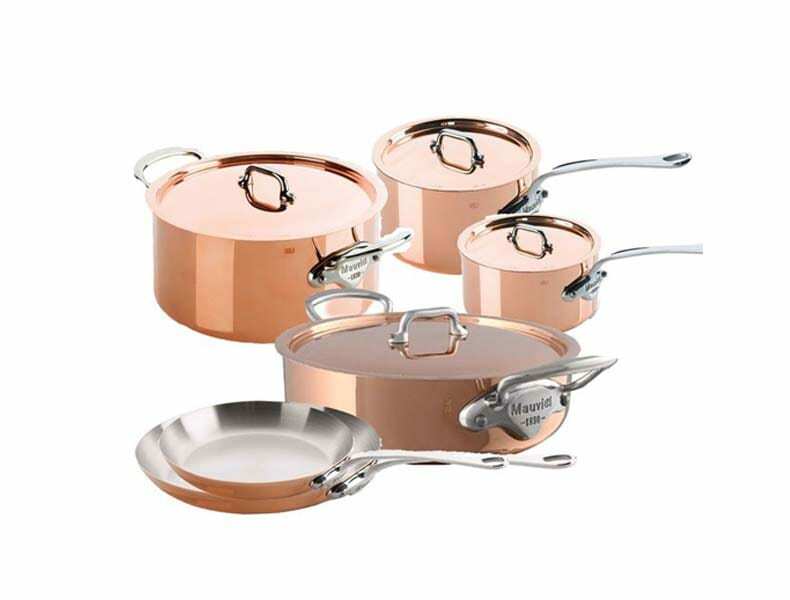 Ernest Mauviel set up the Mauviel company creating copper pans that have become synonymous with quality loved by both professional chefs and home cooking enthusiasts alike. The price tag on copper pan sets is often pretty eye-watering however the life expectancy of Mauviel copper pans will definitely justify the investment! Food Processor: KitchenAid is an American brand that dates back to 1918, one of the first ever stand mixer producers renowned for making quality machines for home use. I have it on my list of ‘goals for 2018’ to invest in a KitchenAid as most of the recipes I read require a food processor! 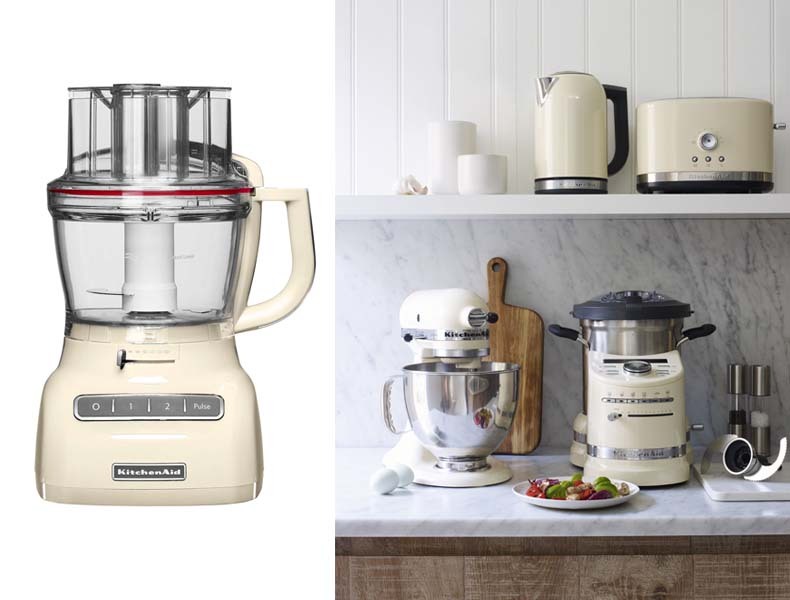 I love the classic look of the KitchenAid and the cream colour would compliment our existing kitchen accessories.– I’m ready to become a regular little Julia Child!